Peace and calm are two things that come to mind this beautiful holiday Springbok puzzle, "Angel and Dove". 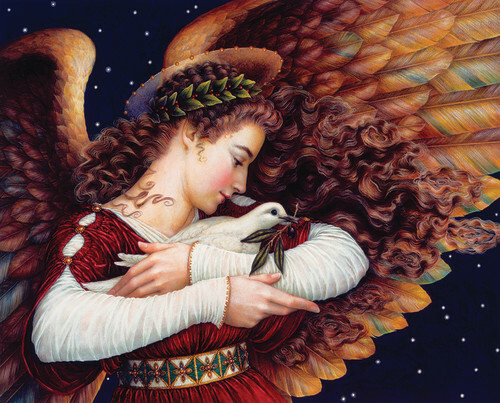 This puzzle depicts an angel with flowing hair and colorful wings cradling the Dove of Peace in her arms and will surely be a holiday favorite! The finished puzzle was one of the most beautiful puzzles I have ever done. The colors are particularly rich and you can almost feel the textures of the feathers. Moderate difficulty, but worth the effort!